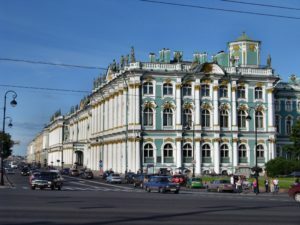 The Hermitage, also known as the Winter Palace, was the main residence of the Russian Tsar’s. The palace and it’s interiors were designed and built under the supervision of the famous italian architect Bartholomeo Rastrelli. Hermitage owns a great collection of the paintings of classical and modern artists. Among them are Da Vinci, Rembrandt, Roubens, Botticelli, Michelangelo, Goya, Durer and many others. The Paul’s Palace in the city of Pavlovsk was built in 1784 by the architect James Cameron for Paul, the son of the Empress Catherine II. The landscape park of Pavlovsk named to be the largest in Europe, and the best in the means of planning.